Execute a command list from a thread group. The number of groups dispatched in the x direction. ThreadGroupCountX must be less than or equal to D3D11_CS_DISPATCH_MAX_THREAD_GROUPS_PER_DIMENSION (65535). The number of groups dispatched in the y direction. ThreadGroupCountY must be less than or equal to D3D11_CS_DISPATCH_MAX_THREAD_GROUPS_PER_DIMENSION (65535). The number of groups dispatched in the z direction. 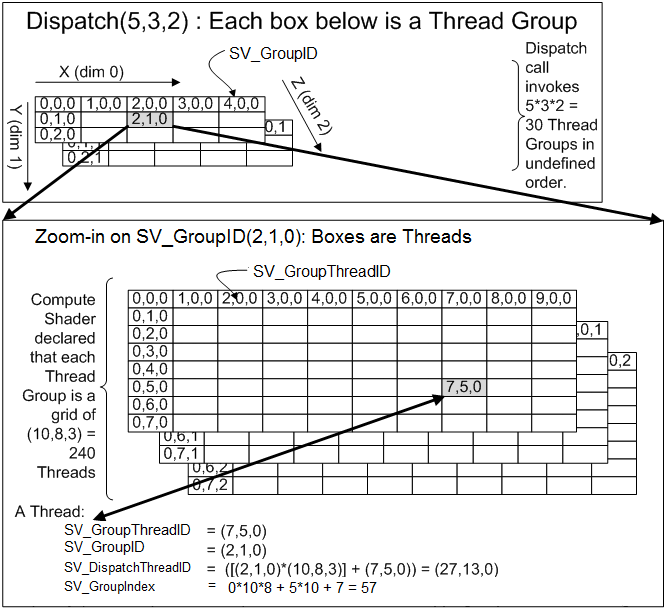 ThreadGroupCountZ must be less than or equal to D3D11_CS_DISPATCH_MAX_THREAD_GROUPS_PER_DIMENSION (65535). In feature level 10 the value for ThreadGroupCountZ must be 1. You call the Dispatch method to execute commands in a compute shader. A compute shader can be run on many threads in parallel, within a thread group. Index a particular thread, within a thread group using a 3D vector given by (x,y,z). In the following illustration, assume a thread group with 50 threads where the size of the group is given by (5,5,2). A single thread is identified from a thread group with 50 threads in it, using the vector (4,1,1).